You can help to reduce the impact of a flea beetle problem by doing all you can to make sure plants grow as quickly as possible through the vulnerable seedling stage and become sturdy, healthy plants. Keep plants well watered and avoid sowing too early into cold soil. Growing seedlings in containers and planting out once they have grown larger could also help to make sure you don’t lose too many plants. A number of different creatures can be encouraged in your polytunnel in order to keep a natural balance and keep pest numbers down. 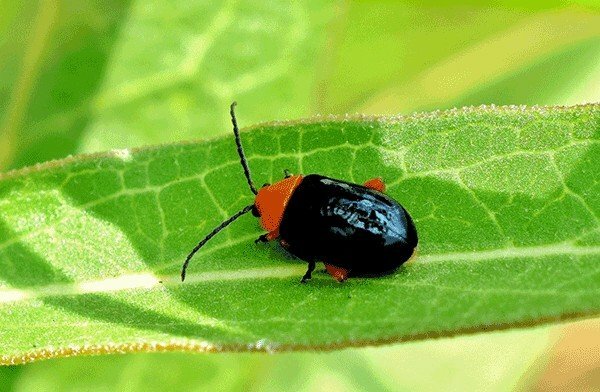 There are a number of creatures will eat or disrupt the life cycle of flea beetles, including Braconid wasps and tachinid flies, both of which parasitise and feed on the flea beetle at the larval stage. Some species are also important pollinators when they reach maturity. In order to attract these beneficial insects, plants such as coriander, fennel, pot marigolds and yarrows can all be sown between crops. In addition to planting flowers and herbs to attract beneficial insects, you should also consider planting companion plants that repel flea beetles, making them less likely to take hold and cause a lot of damage in your polytunnel. Thyme, catnip and various other mints are examples of beneficial companion plants that can mask the scent of nearby plants and therefore reduce the chance of them being discovered and decimated by flea beetles. Another way to deal with a flea beetle infestation in your polytunnel is to plant sacrificial trap crops near the entrances which will tend to lure flea beetles away from your more important crops. Radishes, for example, are swift to grow and could help to keep slower-growing brassicas safe. Nasturtiums can also serve as a good trap crop for flea beetles and other beetle pests such as squash beetle, and can grow prolifically in a polytunnel, so is usually able to deal with the infestation without succumbing. Though all the above methods can help you to make sure that you do not lose too many plants to a flea beetle infestation, there is no sure fire way to completely eliminate them from your polytunnel if they are prolific in your area. However, you could exclude them entirely from a particular growing area of high-value or particularly prized plants by using a mesh or netting to stop the adult beetles from reaching them.